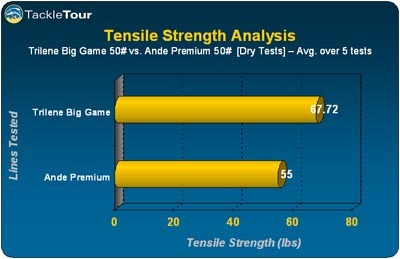 Introduction: Trilene Big Game is among the most well known offshore lines and the company makes some pretty bold statements on their website including "In key tensile strength tests, Trilene Big Game outperforms Ande�" We decided to put that assertion to the test and see if Big Game could really deliver on its pledge. Impressions: Trilene is a popular series of line within the Berkley brand. Berkley makes a complete range of products including an assortment of lines, PowerBait, Gulp! lures, Frenzy hardbaits, rods, and numerous accessories. The Berkley brand is part of the massive Pure Fishing organization which also owns many notable tackle companies including Stren, Abu Garcia, Fenwick, Mitchell, Johnson, Spider, and 7Strand. We have used many types of Berkley lines in the past and the 10lb and 12lb lines are among our favorite for testing bass lures due to its consistency and reasonable price. In fact it was over three years ago when we tested Trilene Big Game 12lb in our very first line review ever. Since that time TackleTour has grown and so has our lab and test capabilities. We decided it was high time to get back to our line reviews with our new equipment and test Trilene Big Game in the application it was really designed for...taking on big offshore fish. But before we would entrust BG50 (Big Game 50lb) with our offshore duties we had to see if this line could really beat our current saltwater line favorite, Ande Premium Finish. We procured four spools of 1lb spool of both Big Game 50# and Ande Premium Monofilament 50# and got to work. Note: Ande Premium Line is designed for the vast majority of anglers. The company also produces the Tournament series which is designed and manufactured to conform with all IGFA tests from 2-130lb. tests. Lab Tests: On both lines we measured average diameters, and tensile tested both lines pulling samples from a minimum of two spools. In the wet line tests the samples were submerged for 20 minutes at a temperature of 25 degrees Celsius. 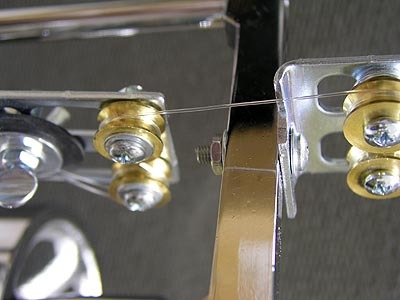 All lines were tested on our TackleTour tensile tester which was calibrated both before and after each series of tests. Because we were testing a 50lb line designed for an offshore trolling application we were most interested in tensile strength and line stretch rather than abrasion resistance in this particular series of lab tests. Before subjecting the lines to our tensile tester we measured the all the sample diameters. Both BG50 and Ande Premium 50 gauged at an average .028" average diameter. The Ande was a little bit more consistent, but both lines were within published specifications. Smaller diameter lines will cast easier as well as have less drag when trolled at high speed. 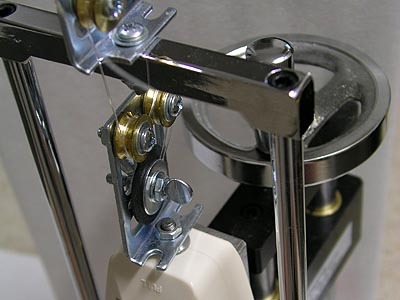 Tensile Strength (Dry): Tensile testing 50# line would tax the limits of our normal tensile tester so we used our "big dog" which is capable of testing any line or drag up to 130lbs. We averaged the results of five tests on each line, and sure enough Trilene Big Game outperformed Ande Premium time and time again. Both lines easily surpassed their 50lb rating but the Big Game actually topped out just under 70lbs before finally breaking! 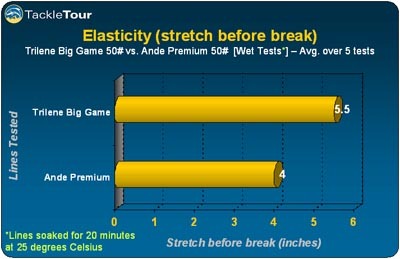 In the first round of tests the Big Game performed about 18% better than the Ande Premium 50lb. Tensile Strength (Wet): After waiting 20 minutes we were ready for our second round of tensile tests, this time using soaked lines. As expected both lines now broke under less pressure, but the Trilene Big Game continued to reach well over 60lbs before breaking. 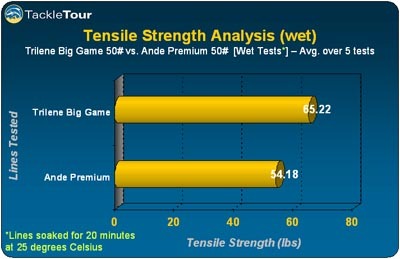 Interestingly the Ande Premium was less effected percentage-wise than the Trilene Big Game when it came to maintaining tensile strength when wet. This peaked our interest, and in a future lab test we will examine prolonged absorption affects on tensile strength over an extended period. Stretch (Wet): Line stretch is important for shock and fighting power. In our tests the Ande Premium was a bit spread out over the charts, where as the Trilene broke at almost the exact same "stretch" each and every time. This controlled stretch before failure showcased Big Game's shock resistance, but also makes Ande a superior line when it comes to sensitivity. Both of these lines are reasonably thin in diameter for the 50lb rating, but during our stretch tests we couldn't help but notice that the Ande seemed to feel softer and more manageable. But with power being the more important factor over sensitivity when it comes to trolling the Big Game trumped the competition yet again. Real World Test: With our lab tests complete we felt assured that Trilene Big Game 50# was the right line to make use of in our offshore field test. We called upon our trusty Daiwa Sealine SLT30, which had most recently done battle with Humboldt Squid, for the offshore trolling field tests. 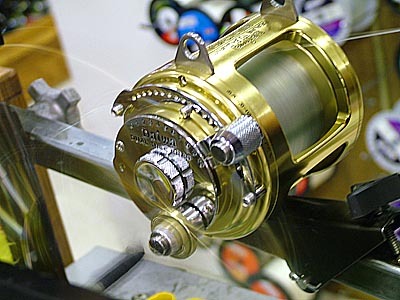 We recommend a high speed line spooler or taking the reel to your local shop to pack the reel properly. By going to a shop you will only need to pay for the line you have spooled, and will get the tightest line pack possible when spooled with a superior machine. A machine with 2hp or greater should be used when tightly spooling big game reels like the SLT30, and it certainly helps when you have an experienced operator winding your reel. 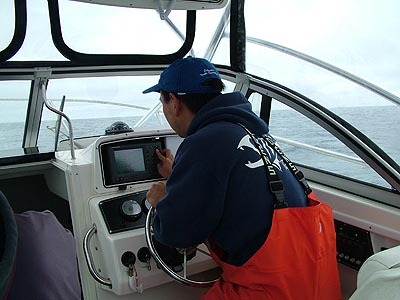 With our reel loaded with BG50 we partnered up with Captain Ivan and launched out of Half Moon Bay for a 35mile offshore run in hunt of some Albacore Tuna trolling action.